Close Brothers Retail Finance has launched CBRF2020, a challenge to fundraise £20,000 for local charity, Jigsaw4u, which celebrates its 20th anniversary this year. Close Brothers RF is aiming to achieve this target by 20 September and is working with other Wimbledon businesses to host a variety of fundraising events, including a quiz night at The Terrace, annual CBRF Bake Off competition and various activities with Nuffield Health including Barre Concept and Bodyjam classes open to everyone, not just Nuffield members. Love Wimbledon’s Events & Marketing Manager, Katie has also shown our support for this amazing initiative by joining the CBRF team in the Thames Path Challenge. To celebrate and wrap up this colossal effort, completed at such an incredible pace CBRF will be hosting a special evening event in the heart of London on 20 September at City Hall, which includes a silent auction as the final element in this mammoth fundraising challenge. Jigsaw4U is a local charity helping children and young people across SW London and Surrey who have been affected by complex social and emotional issues, including bereavement, domestic abuse and child sexual exploitation. Pod2 soft play at YMCA Wimbledon has loads of fun activities for under 8s. Toddlers and young children can jump, slide, wriggle and crawl their way around the brightly coloured, multi-sensory structure using their imaginations and being physically active. It’s a great place to make new friends and to learn to play with other children. Parents can relax with a coffee or snack from the soft play coffee bar or go upstairs to the child-friendly cafe for something more substantial. Pod2 has everything a child needs for an energetic, creative, interactive indoor adventure! Open seven days a week, Pod2 is also available for private hire and children’s parties. Visit Pod2 at YMCA Wimbledon for more details. Collaboration between Wimbledon College of Art and Creative Learning at New Wimbledon Theatre opens door for local young artists to gain invaluable theatrical training and experience. New Wimbledon Theatre’s Stage Experience is a two week summer school style course offering young people (11-18yo) training and experience as professional theatre makers, either as performers or young assistants. Performers work with the Theatre’s professional creative team to train in musical theatre performance and feature as the cast of the production, while Young Assistants gain personalised individual training with the Theatre’s creative team in off stage roles, such as directing and stage management on an actual production. In addition to Adam, Creative Learning has also brought in a team of hair and make-up artists who have just graduated from Delamar Academy. This is their first production as a team in their own right and they are working with Adam to create looks for every character in the production. Stage Experience Bugsy Malone at New Wimbledon Theatre (25-26 August) is a professional production with a cast of young people, full of emerging talent. Inspired by Wimbledon Guild’s work, keen swimmer Imogen is tackling three gruelling open water challenges, swimming almost 20 kilometres, to raise funds to support the Wimbledon based charity. A chance encounter with an elderly lady on a canal bank inspired Imogen Horn to give up her time and volunteer as a Befriender with local charity Wimbledon Guild. The 21-year-old now loves spending time with 83-year-old Vera, to whom she was introduced by the charity, and is taking on three gruelling swimming challenges to raise funds to help support Wimbledon Guild’s work. “I was on a walk along a canal one day and I saw an older lady on the opposite bank – I’m not really sure why but I had an urge to wave to her. “She waved back and I carried on but she still stood there. It was such a brief interaction but it really touched me for some reason. The plight of those suffering from loneliness continued to play on Imogen’s mind until she spotted Wimbledon Guild’s Mitcham charity shop from the bus one day. “I love being a befriender! I am paired with one of the most interesting, strong and kind-hearted women I have ever met. I have learnt a huge amount from her and also found a great friend. “Befriending is definitely not what I imagined. I thought it would be a very tame and gentle chat over a cup of tea whilst I desperately thought of what to say next. It is SO far from that! We have become really close, to the point where it is like talking to one of my housemates! I hope I have in some way improved her life, as she has certainly more than done the same for me. “When you think about it, there are so many people in this position and I wish we could all do something about it and open our doors to let people in and likewise be welcomed in by others. Imogen completed the first of two 5k swims, the Great London Swim at Docklands on 1 July. Next she is due to take part in the 8.3 km Long Reach Swim along the Thames near Oxford on 20 August. Her final event will be the 5km River Adur swim near Brighton on 26 August. You can support Imogen’s fundraising for Wimbledon Guild by donating here. Anyone interested in Befriending or volunteering any support can visit Wimbledon Guild, call them on 020 8946 0735 for an informal chat, or email volunteer@wimbledonguild.co.uk to find out more. Autumn at New Wimbledon Theatre is looking better than ever this year, with a wide array of entertainment on offer across the main auditorium and newly refurbished Time & Leisure Studio. The brand new tour of Cabaret opens here on 21 September, starring Will Young who reprises his role as Emcee, alongside Strictly Come Dancing colleague, Louise Redknapp in the iconic role of Sally Bowles. This spectacular production, directed by Rufus Norris has enjoyed two smash hit West End runs, and features show-stopping choreography and some of the most iconic songs in musical theatre. After a thrilling turn as Millie Dillamount earlier this year, Joanne Clifton returns to Wimbledon with more of her glitterball winning moves as Alex Owens in Flashdance-The Musical alongside A1 heartthrob and songwriter Ben Adams as her love interest Nick. Two female icons of the swinging sixties are celebrated in November. Cilla-The Musical tells the legendry story of Cilla Black, following the early years of her career and soundtracked by her own hits, with appearances from her good friends The Beatles and starring Kara Lily Hayworth who won the role after a nationwide search for the perfect star. Son Of A Preacher Man stars Diana Vickers, Debra Stephenson and Ian Reddington, in this brand new music biopic of Dusty Springfield, directed and choreographed by Craig Revel Horwood. Enjoy exclusive audiences with Greg Rusedski in September and Katie Price in November, as well as a variety of comedy, music and family shows, there’s something for everyone at New Wimbledon Theatre, culminating with the ever-popular family pantomime. This year, Jack and the Beanstalk stars Pub Landlord Al Murray, and Olivier Award-winning Clive Rowe. The newly refurbished Time & Leisure Studio stages all the very best in theatre, opera and live music from around the world, and is now also fully equipped for cinema screenings. This season will feature the Royal Shakespeare Company, Shakespeare’s Globe, David Gilmore: Live from Pompeii, and spectacular opera from the famous floating water stage in Bregenz, Austria with Carmen on The Lake: a visual spectacle not to be missed. The studio is also a great launch pad for comedy and new plays and musicals, hosting the European premiere of Tenderly-The Rosemary Clooney Musical will runs from 1-23 September, regular Laughing Boy Comedy nights, and the ultimate night out, Opera Bites Dining Experience on Saturday 7 October. Wimbledon’s Gourmet Burger Kitchen is one of just a select few of the brand’s restaurants to launch their all-new brunch menu. 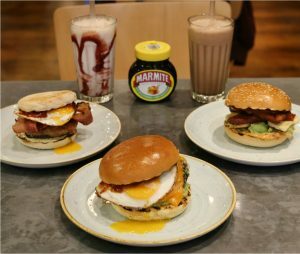 Breakfast is the most important meal of the day and now you can tuck in to some tasty new brekkie burgers, including the Dawn Horn (crispy bacon, pork sausage patty, grilled garlic mushrooms, fried egg, mustard mayo, breakfast relish) and the Clucky Bun (panko chicken, avocado, fried egg, jalapeno cream cheese and maple syrup). And for the perfect pairing there’s a choice of four glorious milkshakes: Chocolate & Marmite, Earl Grey, Cornflake or Strawberry & Granola. The new menu also includes muffins, veggie options, extra toppings, fries, teas, coffees and fresh juices. And there’s also an Early Bird Bundle served before noon for just £5. The GBK Brunch menu is available every Friday, Saturday and Sunday from 10am to 2pm.